A blend of flavoured lime juice with sugar and sweetener. Premium quality.Delicious, expertly blended, bar quality Mojito Cocktail mixer made with the finest real fruit. Great tasting and less than 100 calories per cocktail*. 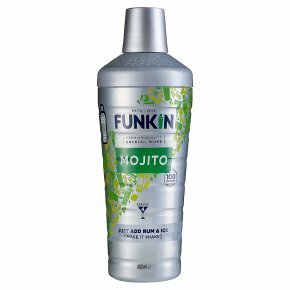 *Less than 100 calories per cocktail when mixed as suggested with 25ml of Rum per 100ml Funkin Mojito Cocktail Mixer. To enjoy four premium cocktails simply peel lid, add 4 x 25ml caps of your favourite Rum (8 x 25ml caps for a bar strength serve), top up with plenty of ice, shake and serve. Best served over ice in a tall glass, with a sprig of mint and a slice of lime to garnish. Shake it up before use. Best served ice cold.